Exactly a year to the day since the French-supported Louvre Abu Dhabi opened, the United Arab Emirates (UAE) gained another art institution yesterday (11 November). The 10,000 sq. m non-profit Jameel Arts Centre is the first of its kind in the country in that it is not financed or run by the state. Funded by the private Saudi Arabian organisation Art Jameel, the centre designed by the UK-based firm Serie Architects features a research centre and library, an events space, and an outdoor sculpture area as well as 1,000 sq. m of galleries. Led by Antonia Carver, the former director of the Emirate’s Art Dubai fair, the centre will show both Middle Eastern and international contemporary art, some of which will be drawn from the several hundred-strong Jameel Art Collection that includes artists such as Kader Attia, Monir Shahroudy Farmanfarmian, Ahmed Mater and Conrad Shawcross. The inaugural group exhibition, spread over five galleries on the centre’s first floor, looks at the Middle East’s complex relationship with oil as a driver of both development and political upheaval in the region. “We wanted to start as we mean to go on, with deeply researched, highly discursive exhibitions that engage with particularly dynamic artists,” says Carver. The artists on show include Latif Al Ani, Hassan Sharif, Wael Shawky and Lantan Xie. The centre was also due to hold the Abraaj Art Prize collection—an annual prize in Dubai that has been sponsored by the private equity firm Abraaj Group since 2009—but the plans fell through after the business went into liquidation in June this year. 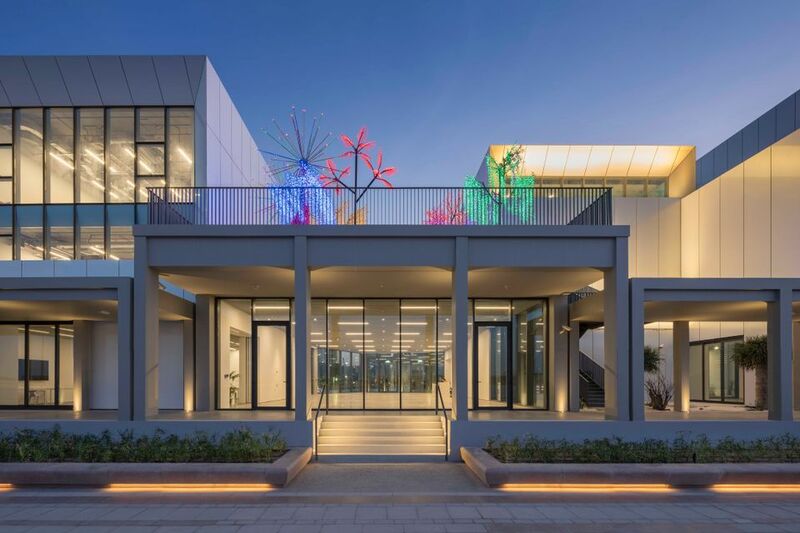 The Jameel Arts Centre is the first dedicated space for Art Jameel, which is the cultural philanthropic arm of the Saudi business conglomerate Abdul Latif Jameel. Their other projects include the Jameel House of Traditional Arts and Jeddah Sculpture Museum in Saudi Arabia and a number of international partnerships, such as with London’s Delfina Foundation, the Victoria and Albert Museum, and the Metropolitan Museum of Art in New York. So why did the Saudi-based foundation open a space in Dubai? “The decision reflects the strong role the UAE art scene has been playing across the larger region—and the country's unique position as a global meeting place, allowing us to draw on and continue to build upon the extensive network of artists and partner organisations that Art Jameel has built across the region and globally,” says Carver. Construction is also underway on Art Jameel’s first space in Saudi Arabia. Hayy: Cultural Hub in Jeddah, a multidisplinary space that includes an art centre and arthouse cinema, is scheduled to open in 2020. Saudi influence in the UAE’s cultural sphere seems to be on the rise. Although the Jameel Art Centre is funded privately, there are also an increasing number of state-sponsored cultural endeavours from the Kingdom in the Emirates. At this year’s Art Week in Dubai in March, the Saudi state cultural institute Misk held several events partnering with the fair Art Dubai and the gallery hub Al Serkal Avenue, including an exhibition and symposium on Arab Modernism, the launch of a Virtual Reality film, and an art book fair. Art Dubai announced in October that Misk will again be involved in the 2019 edition of the fair, but details are yet to be announced.